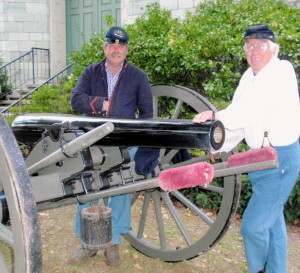 Jeff Stafford (left) and Richard Neff greeted visitors at the opening Thursday night of “On the Edge of Battle: Chester County and the Civil War” at the Chester County Historical Society in West Chester. In keeping with the authenticity of the compelling, comprehensive exhibit, the rifled cannon was the real deal, made in 1861 at the Phoenix Iron Company in Phoenixville, which produced many of the weapons used by the Union Army. “It was fired last weekend in competition,” said Richard Neff, attired in period garb with the massive rifle’s owner, Jeff Stafford. Neff explained that the two are skirmishers – not to be confused with re-enactors. “We actually shoot at targets,” he said. The Chester County Historical Society’s Civil War exhibit includes clothing, paintings, letters, and myriad artifacts with county ties. The realism continued inside, where the exhibit’s myriad organizers worked for well over a year to distill the Historical Society’s vast collection of Civil War artifacts into a main-gallery showcase, highlighting Chester County’s pivotal role in the nation’s bloodiest conflict. “We could have filled multiple rooms,” said Heather Hansen, the collections manager. As work on the project developed, memorabilia and documents were painstakingly cross-referenced and researched, said Diane Rofini, the society’s librarian. The results transport viewers to a tragic period in history, chronicling poignant stories of Chester County residents through letters, newspaper clippings, written records, clothing, accessories, medals and photographs. “Many of the stories are heart-breaking,” said Rofini, referencing one soldier who writes home to express his profound grief over learning his young son had died. Another tragic tale focuses on a music-loving, 12-year-old Chester County boy, who met parental resistance when he wanted to join the Union army as a drummer. Eventually his parents buckled under pressure from Capt. Benjamin Sweeney, who had heard the boy play and assured his parents he would be safe. During the Battle of Antietam in mid-September 1862, a shell exploded near young Charles “Charley” King, blasting him with shrapnel. He died three days later in a field hospital, the youngest soldier to lose his life. 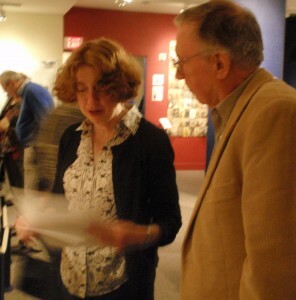 Librarian Diane Rofini flips through one of the transcriptions prepared by George Ehrgott (right), a volunteer. Most of the letters in the exhibit, written in such elaborate cursive that they are difficult to read, were transcribed by volunteers like George Ehrgott to facilitate viewers’ time-traveling. “It was easy to become attached to these people,” Ehrgott said. The recipient of one of the angriest letters remains a mystery, Rofini said. The writer was Virginia Humickhouse of Shepherdstown, W.Va., whose husband was imprisoned at Fort Delaware, a factor that likely influenced the diatribe she penned to her cousin. “Our soldiers have driven the Yankees from Winchester through to Maryland,” she wrote. “We feel free from the filth and pollution of Yankees … the most loathsome set of human race.” Rofini said the fact that the letter landed at the Historical Society suggests the cousin lived in the area. Other featured individuals have a more precise connection. Galusha Pennypacker, a soldier from Schuylkill Township, gets center stage in the exhibit, which includes a letter he wrote to his grandmother, his sword, uniform, accessories, medals, and photos. Some of the dramas involved both past and present family ties: Rofini’s sister, Laurie Rofini, directs the Chester County Archives and Records Services, a county and Historical Society partnership that contributed complementary material to the exhibit. The archives’ collection enables visitors to view township voting records for the 1860 presidential when Abraham Lincoln faced off against John C. Breckinridge, a Southern Democrat who supported slavery. Lincoln was quite popular in Newlin Township, where he garnered 81 percent of the vote. Citizens in New Garden, which included Avondale at the time, were slightly less impressed at 61 percent, a contrast to East Pikeland, where Lincoln only received 23 percent of the vote. “It’s fascinating to see such dramatic differences,” Laurie Rofini said. Among the numerous other treasures: An 1866 campaign sign for Hiester Clymer, who ran for Pennsylvania governor as “the white man’s candidate,” a 1890s photo of Brandywine Grand Army of the Republic (GAR) Post 54 in Coatesville, and an 1864 quilt made by women in Newlin Township that was auctioned at a fair for $200 to help fund the field hospitals. 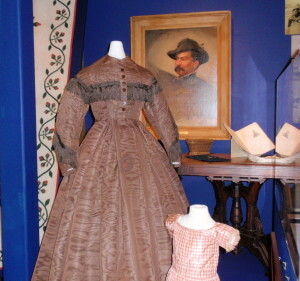 Hansen said the exhibit was constructed to be child-friendly and features many interactive opportunities, such as an encampment space where kids can try on Civil War clothing and a section where they can practice bandage-rolling. Rob Lukens, the Historical Society president, told the opening-night audience of more than 200 people that the society hosts about 10,000 students a year from 50 schools and is looking for financial assistance to boost those numbers. Founded in 1893, the Chester County Historical Society works to preserve the county’s rich past, which dates back to 1682 when it was established by William Penn. The society has seven galleries filled with hundreds of objects, including nationally-recognized 18th and 19th century decorative arts, manuscript and photo collections. All combine to provide insight into the daily life and work in the region from the 1600s to the present. The Chester County Historical Society is located at 225 N. High St., West Chester. Hours are Wednesday through Saturday, 9:30 a.m. to 4:30 p.m. For more information, call 610-692-4800 or visit http://www.chestercohistorical.org.